Located in Plomeur in the heart of the Pays Bigouden, Camping Lanven *** offers both the pleasures of the sea and the charms of the countryside. 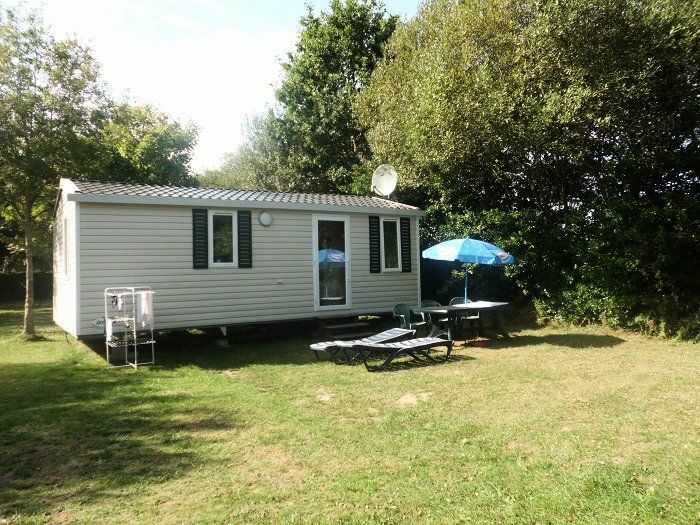 Located less than 3km from the sandy beaches of Audierne Bay, this family-friendly campsite offers you a large choice of mobile home in a shaded and sunny 4-hectare park. For your entertainment you will have a playground for children, a ping-pong table, a volleyball and badminton court, a petanque, a TV room, a games room a billiard table and a marquee of 96m² for entertainment (theme evening, dance, concert ...). Possibility to rent bikes directly on site. The beach of the torch a few minutes by car from the campsite is a real paradise for lovers of skiing, its long stretch of fine sand offers a breathtaking panorama of the bay. A breakfast is served from 8h to 12h, on the terrace or in the room. The campsite puts & nbsp; also available, a launderette with washing machine, dryer and ironing board. Mobile home 29m² for 4 people, consisting of a kitchen area, a living room with dining area, a bedroom with a double bed, a bedroom with 2 single beds, a bathroom with a shower and separate toilet. The mobile home is equipped with a hob 4 gas burners, a refrigerator, a microwave, a coffee maker, a toaster and all necessary utensils. Blankets and pillows are provided. The terrace is equipped with garden furniture with table, chairs and umbrella. Access: From Quimper (26km), take the D137 until Pont l'Abbé then follow Plomeur.